Have you heard the news? RacePlayMichiana has a new feature. If you haven’t checked out our Group Therapy page yet, it’s a must read. It’s full of free or low-cost groups getting together around Michiana to get moving! On the list, we’ve included all kinds of communities in case any Michiana-ganda-oosiers (what is our collective name, anyway? )/RPM readers want to join in on the fun. Here, on In Motion with RacePlayMichiana, we’re adding something new and different to our monthly content, too. Every month, we’ll feature a new Michiana group from Group Therapy that’s getting out and being active. So each month, you can expect a little peak into their community’s world. For this month (National Bike Month, est. in 1956! ), we got the inside scoop on Bike Michiana Coalition and their May 7th event, the second annual Mayors’ Ride (more details below!). BMC’s board member, Karen Haun gave me all the deets about the event and the coalition. Bike Michiana Coalition was established in 2008 as a local non-profit bicycle-advocacy organization. In short, they aim to establish a bicycle-friendly community through the primary goals of facilitating communication between other bicycle groups, as well as advocating action and education in the community. Earned a Bronze Bicycle Friendly Community ranking from The League of American Bicyclists. Here’s a peak at South Bend’s report card and how we can improve to Silver status. And BMC has a few projects in the works for this special biking month, too. National Bike to Work Week takes place this year on Sunday, May 14th through Saturday, May 20th. BMC has organized local events for Bike to Work Week since its creation. BMC’s mission in hosting this week? Companies can participate by signing up for a team, on the Michiana Bike to Work Week website and recording their miles. Karen said it’s likely they’ll have more biking trips during the week, so check back on the official website leading up to that week. And of course, they’re hard at work putting together May 7th’s Mayors’ Ride. 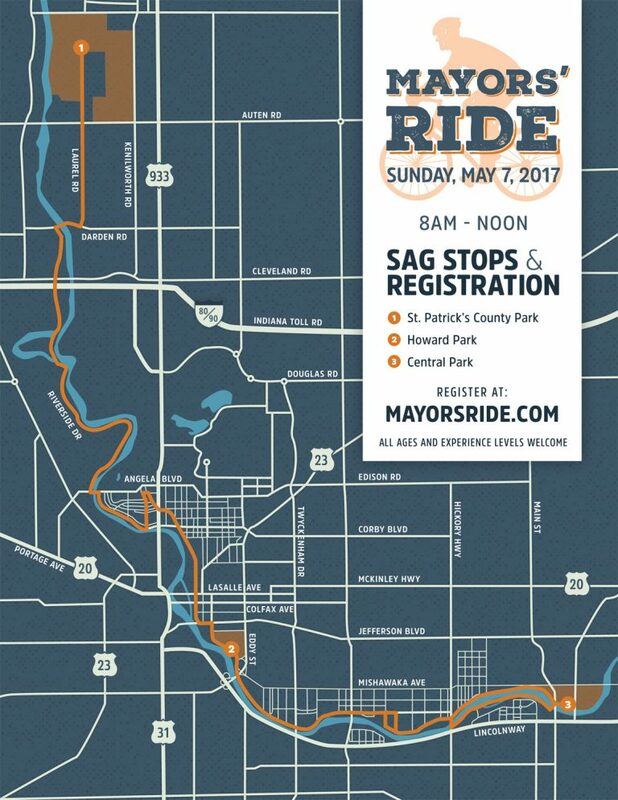 Mayors’ Ride 2017 Details — Sunday, May 7, 2017, 8 a.m.–12 p.m. The Mayors’ Ride is a chance for locals to get out and enjoy South Bend’s, Mishawaka’s, and St. Joseph County’s connected bike paths. The ride is completely free and fun for the whole family, no matter age or skill level. You can also choose to make a donation of $10 online or at the event, which will go toward BMC’s education initiatives. Every participant must complete a waiver, which can be downloaded here. What a wonderful opportunity to get outside and enjoy a nice Sunday ride alongside Mayors Pete Buttigieg and Dave Wood! And a chance to support Bike Michiana Coalition’s mission? It’s a win-win. Writer’s Note: All images in this post were used with permission from Bike Michiana Coalition; copyright for included images does not belong to RacePlayMichiana. Thanks for the great information on biking events in the area.